Here are some of the best pictures of Hollings pink and brown nursery. I am a professional photographer and I thought that my baby girl's nursery design should be well documented. I have taken many, many photos of the baby's room and here are a few of my favorites. My husband is a building contractor and took care of all the finishing touches such as the wooden molding. His chosen profession as a building contractor and mine as a photographer served us well in designing and photographing Holling's first room. 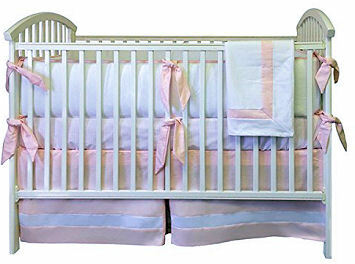 Hollings' pink and white crib bedding set features both tailored and feminine touches and a chocolate brown border. The crib that you see in the nursery pictures was given to me by my older sister. My mother bought it for her when she had her first baby boy. Her sons are now 10 and 8. It is a gorgeous Italian made crib that now my two daughters have used as well. The baby bedding set is all white with chocolate brown trim and came from Pottery Barn Kids along with the crib mobile, the nursery wall letters, the chocolate brown polka dots, picture frames and the nursery chandelier. My husband built the wooden box that sits beside the rocker in college and my best friend refinished it painting it in the colors of Hollings pink and brown nursery. I love it, and it provides extra storage space which is needed as the room is really small. The pink paint color on the walls is Ralph Lauren's Tea Rose that seemed appropriate since my first daughter's name is BellaRose. I can't remember the name of the chocolate brown wall paint but I think it is called Stable Brown, because I loved the name because I grew up riding horses! The dark brown color is so rich you could almost eat it! I studied many pictures of pink and brown nurseries and came to the conclusion that it would be best to have the main color of the room to be on the walls and everything else to be white with just a few accent colors. 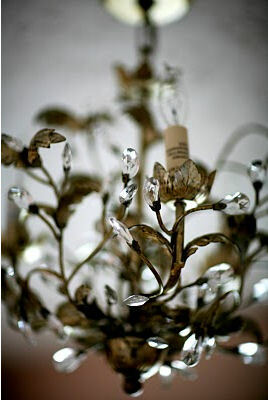 Obviously, since photography is my art that is what decorates Hollings pink and brown nursery walls. My baby girl's nursery is very calm and serene and a lot of love went into its design. I hope that you will love it as much as we do! 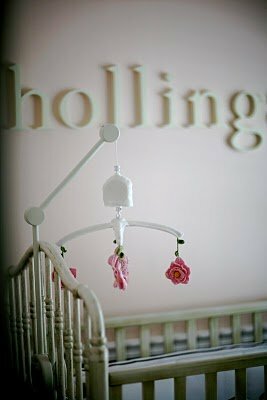 Sunday, thanks so much for sharing pictures of Hollings' lovely nursery with us. It's always a pleasure to see a room like hers that is composed of so many interesting decorative elements with a story behind them. There's so much of the family's personality in your design that makes it unique and interesting. And I see you put just as much thought into pictures that you take in your photography business. To see the world through your lens has been a real treat for me and I hope that all of our visitors will not only vote for Hollings pink and brown nursery design in our baby nursery pictures contest but that they will visit my photo blog. If any of Unique Baby Gear Ideas' visitors are in the Asheville NC area, do yourself a favor and make an appointment for Sunday Grant Photography to take some maternity pictures, baby pictures or family portraits! The mobile is from Pottery Barn kids. It was on sale at the time my mother in law bought it for us so I don't think it is there anymore. 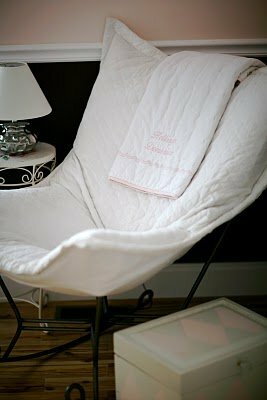 Did you crochet the roses on the baby's crib mobile or did it also come from Pottery Barn kids with the baby bedding set? If you made your own mobile and crocheted the roses yourself, would you please tell us where you found the pattern? This is a lovely nursery! I have had the blessing to know Sunday for a very long time, and this is exactly what I would expect from such a beautiful person...simple, yet elegant.A nursery that is truly beyond beautiful, you can tell that alot of her soul went into this nursery, as well as her heart. I love this room. 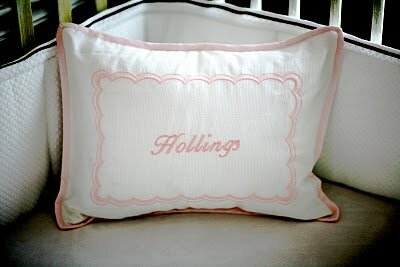 Simple, beautiful...and precious...just like Hollings! You have an eye Sunday for beauty in how you decorate and your photography...and Worth is a great accompaniment with is craft! What a sweet nursery this is! There is absolutely nothing prissy or cutesy about it. It's just classic. The pink color truly is so soothing--perfect for a baby's room. I actually chose it for my daughter's nursery after seeing how perfect it was in BellaRose's nursery. Great Job, Sunday and Worth! I love how simple, but sweet & elegant everything in the room is. The wall colors are my favorite. I am not a huge pink person, but with the brown, it comes together so well. Great job!! So simple and beautiful! It's perfect! Fit for a princess...a tomboy...or both! This is a gorgeous nursery! It is so sweet and I love all the personal details. Nicely done Sunday and Worth!! This nursery is absolutely beautiful. Well done! This nursery is so sweet, I love it!! Well done Sunday and Worth! I love this little nursery. The mother's love that went into it, carefully picking everything out to all fit together so perfectly, makes it all the more special. Hollings has such a sweet room! This room is so simple and classic. Want to come design my bedroom? I love the simplicity of this nursery. It is indicative of the classic style that makes this family beautiful. Sunday, I love what you did with the nursery...keep taking those beautiful photos! SUPER cute nursery -- obviously a project of love by the two of you... Hope those girls grow up with the same eye for beauty by which they've been surrounded! As the man who built this thing I have a few things to say. It's great because Sunday designed it. It's great because we saved money and time by not doing wainscoting and just using chair rail trim with a different paint color underneath. It's great because I installed a dimmer switch on the lights that really helps with late night diaper changes. It's great because, well, I came up with a better method to mount the letters on the wall than the method supplied by Pottery Barn. Anyone who has attempted to mount these things in a straight and level line will certainly understand the difficulty. And last, the nursery is great because my second daughter sleeps there. Thank you for sharing both my daughter's beautiful nursery with everyone. It is just a serene, happy, elegant place! Thank you also for the photography plug! Join in and write your own page! It's easy to do. How? Simply click here to return to PINK and BROWN NURSERY PICTURES and IDEAS.